To cope with the demands of the more advanced dyer, we have also included in the Low Temp Dye range individual Setting Agent vials. These may be used when there is more than the recommended amount of material to be dyed in one application or where a shorter dyeing time is required. 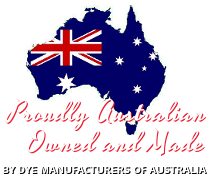 They may also be used when dyeing white (or light) coloured fabrics to black (or similarly dark colours). Using extra setting agent will improve the ability of the dye to be attracted to the garment fibres. With darker coloured original fabrics this additional setting agent should not be required.